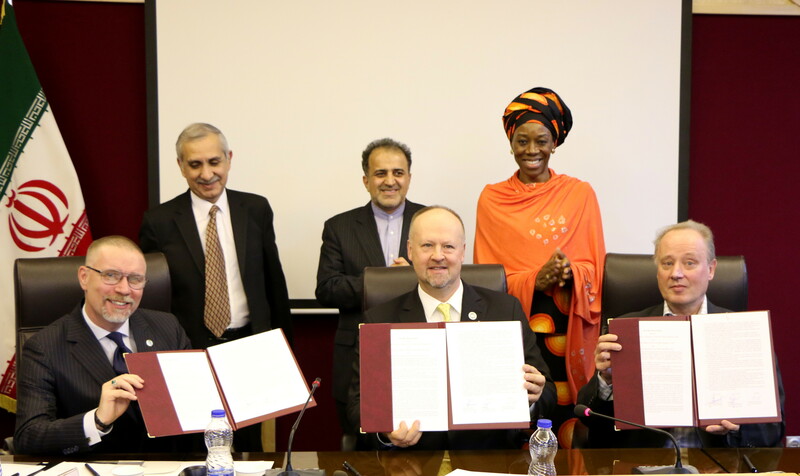 TEHRAN, 3 December 2018 (UNIC) – The United Nations Office on Drugs and Crime in the Islamic Republic of Iran (UNODC), United Nations Children Fund (UNICEF) in the Islamic Republic of Iran and World Health Organization (WHO) in the Islamic Republic of Iran signed today a joint Interoffice Memorandum to prevent and alleviate suffrage of Children and their families as related to drugs. The ceremony took place in Tehran Milad Tower and on the sideline of the United Nations Development Assistance Framework (UNDAF) High Level Committee Annual Meeting, with the support of the Islamic Republic of Iran Ministry of Foreign Affairs. Heads of different United Nations agencies and representatives from relevant national counterparts attend the event. The UNDAF in the Islamic Republic of Iran (2017-2021) provides programmatic platform for joint programmes and programming and the parties are already collaborating in the area of drug prevention and treatment under the Pillar 4 of the UNDAF as “Drug Control”. The main objective of this Interoffice Memorandum is to develop a framework for strengthening partnership between the three UN agencies on prevention and treatment of drug use among children and their families. Within this framework the agencies should develop and fundraise for specific activities, projects or programmes to be implemented in a spirit of cooperation and common commitment to broaden the inherent collaboration of these agencies under the UNDAF in the Islamic Republic of Iran (2017-2021) Pillar 4, “Drug Control”.